Send links of photos to steve@chicagominiclub.conm and I will add them here. Photos by: Steve | Sherri W.
MINI on the Mack is an every two year gathering up in Mackinac Michigan. 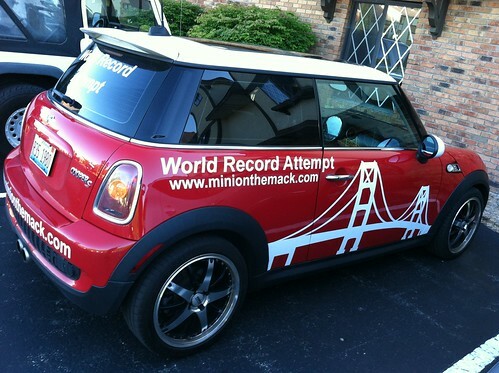 There is an attempt to break the world record for the largest parade of MINI Coopers on Saturday August 5th, and it is a great chance to hang out with about 1500 of your favorite MINI friends. In addition.. there will be several local caravans departing Friday 8/4 and converging on Mackinac. Happy Birthday CMMC!! July 12th 2003 was the first official event for the Chicago MINI Motoring Club. WRAPUP: Fantastic weather brought out almost 60 MINIs to Superdawg.. We have about 40 MINIs participate on the twisty neighborhood drive and got to see the front and back of the line cross each other several times. 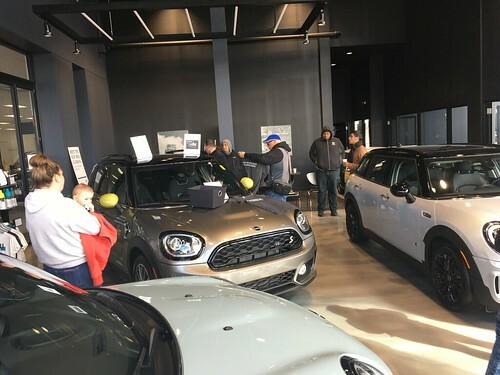 MINIs joined from as far north as Milwaukee, as far west as Aurora, and as far south as Bloomington. Lots of new/first time members plus lots of long-time members. Club shirts were passed out and were very well received. Thanks again to Arnie and Lena for all the route planning, drive leading, and Superdawg logistics for this event! !